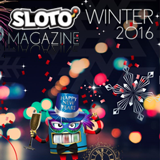 Thousands of Sloto Cash Casino players all over the world are finding the Winter Time issue of Sloto Magazine in their mailboxes this week. The online casino's free printed magazine features articles about slots and enjoying the holiday season. As always there’s a also three-month calendar of casino bonus offers and hundreds of dollars in free spins coupons. The Winter Time issue of Sloto Cash Magazine is being delivered to Sloto Cash players all over the world. In this month’s Mr Sloto comic, Mr Sloto’s dreams of romance come true when Santa brings him a surprising present. Puzzles and contests in the magazine give players chances to win free spins. The prize in this issue’s Trivia Contest is a $33 freebie. Readers that complete the crossword puzzle get 50 free spins on the Santastic Christmas slot game.